Organic anti- hair loss adjuvant shampoo , Benessence. * Adjuvant in the prevention of hair loss. The formulation combines the regenerating and soothing action of Aloe Vera with that of amino acids (Arginine, Citrulline, Ornithine and Cystine) with protective, revitalizing and strengthening properties for the hair. The extracts of the aerial parts of water cress in synergy with the extracts of Ginseng, Capsicum, Hops and Serenoa repens prolong the hair growth phase and promote regrowth. The extracts of Burdock, Green Tea and Linseed are useful as dermopurifying and soothing for the scalp. Formula rich in Minerals and Vitamins that help strengthen the hair fiber. Shampoo with physiological pH, ideal for frequent use. Directions for use : apply to already damp hair, rub gently, leaving to act for a few minutes before rinsing well. Repeat if necessary. 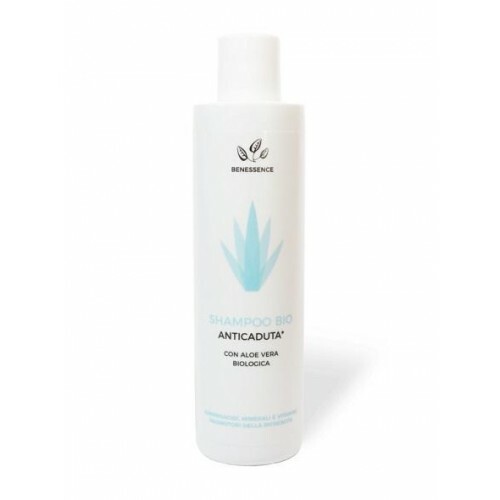 Ingredients: Aloe Barbadensis Leaf Juice, Aqua, Coco-glucoside, Cocamidopropyl Betaine, Glycerin, Disodium Lauryl Sulfosuccinate, Tetrasodium Disuccinoyl Cystine, Nasturtium Officinale Extract, Tropaeolum Majus Extract, Glyceryl Oleate, Hydrolyzed Wheat Protein, Arginine, Panthenol, Arctium Lappa Extract, Capsicum Annuum Fruit Extract, Linum Usitatissimum Seed Extract, Camellia Sinensis Leaf Extract, Panax Ginseng Extract, Serenoa Serrulata Extract, Potassium Lactate, Sodium Chloride, Humulus Lupulus Extract, Calcium Panthotenate, Pyridoxine Hcl, Niacinamide, Ornithine Hcl, Citrulline, Maltodextrin, Tetrasodium Glutamate Diacetate , Citric Acid, Sodium Benzoate, Potassium Sorbate, Sorbic Acid, Parfum.